The Great Tsunami of December 26th, 2004 killed at least 227,900 people. There were no doubt, many tragic stories resulting from this event. But there was one story which had a happy ending for about 400 Christians. Well, instead of fighting the authorities over this issue, those 400 decided to go to a nearby mountain retreat to hold their worship service. But after the service, they decided to spend the night there, and return home the next day. Well, the next morning they returned, only to find that their town has been flattened by that tsunami, which killed many in their town. CHRISTIANS WARNED TO MOVE TO HIGHER GROUND! If those 400 Christians had stubbornly resisted the authorities, then they too, might have been swept away, like so many others! The question is, will we be wise like those 400 who moved to higher ground? Will we turn from our love of this present world, and go up to worship in that heavenly mountain retreat, far above this doomed world? Signs Of Heaven.org is dedicated to providing the biblical information which will prepare us to escape to higher ground. This devotional was inspired from a true story, Published by “Calvary Life Fellowship” 27 January 2005. From time to time, the Book of Revelation mentions stars. But when we get to Revelation Chapter 12, it speaks of two “great signs in heaven”. First, it speaks of the sign in heaven of a woman with child. Then it speaks of the sign in heaven of a great red dragon, with a tail that sweeps one-third of the stars and casts these stars down to the earth. So we get the sense that this phenomenon that the Apostle John was seeing, was closely intertwined with the starry host of the heavens. And these two signs in heaven, a woman, and a dragon, are a big part of this website, Signs Of Heaven. And so this phenomenon that the Apostle John was seeing, was closely intertwined with the starry host of the heavens. WINTER CONSTELLATIONS-SEEN IN FALL: This sketch to the right is how this constellation group appears in the eastern sky in fall. This is the four primary constellations of the Winter Constellations. They can be seen in this position, in the late fall above the eastern horizon. The Woman of Revelation 12 is commonly called Ursa Major or The Big Dipper and appears in the north. 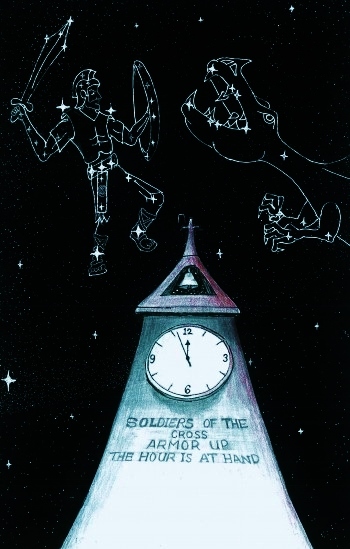 Orion the Soldier is the at the bottom is to the south of the Woman. The The Dragon of Revelation Constellation’s mouth isThe Hyades Cluster, and the tip of his tail is Pleiades, and his Wave of Water is primarily the Auriga constellation. The Glorious Horse Constellation head is of Perseus Constellation and his rear end is Cassiopeia Constellation. “And to the woman were given two wings of a great eagle, that she might fly into the wilderness, into her place, where she is nourished for a time, and times, and half a time, from the face of the serpent. And the serpent cast out of his mouth water as a flood after the woman, that he might cause her to be carried away of the flood.” Revelation 12:14, 15. So this Revelation 12 Woman Constellation gives a heavenly portrait of a woman fleeing from the Dragon, who is spewing water in her pathway. The sketch to the right is “Valley of Decision” Constellation, the Woman of Revelation 12 Constellation, and the Dragon Constellation. This is a concept sketch. 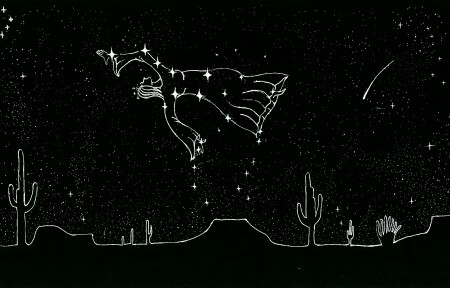 These three constellations are not in this position in the night sky. So please don’t try to find them together like this. All of the other sketches have the constellation in the correct position, unless otherwise noted. For locations of each of these Constellations, please go to the article for that particular constellation.